There’s been a dramatic increase in recent years in the concept of “aging in place.” That is, instead of spending money for assisted living or a similar facility (an average of $3,500 a month), people simply choose to grow old in their own home. While aging in place can certainly be a lot more comfortable, there are a few problems that arise – mainly the fact that the space you’ve always called home may not fit changing needs that come with aging. Aging brings new risks, so if you or a loved one are preparing to age in place, it probably means you’ll be making some changes to rooms around the home. More than one in four seniors over 65 will fall every year, and the vast majority of those falls occur in the bathroom. So if you’re planning some changes to a home for someone aging in place, the bathroom is probably the best place to start. Here’s a look at some of the biggest ways to get your bathroom ready for someone aging in place. You’ll find a few things here that are as simple as buying an item from the store and a few things that require an actual remodel. But whether you have a while to plan and take on major changes or you’re moving in next weekend, you can still make a major difference. Bathing is no small task for someone over the age of 70. It’s where one-third of senior injuries happen. Instead of posing a safety hazard though, a few small changes can make bathing a safe, relaxing experience. For an individual who takes a lot of baths, a walk-in tub is a great addition. 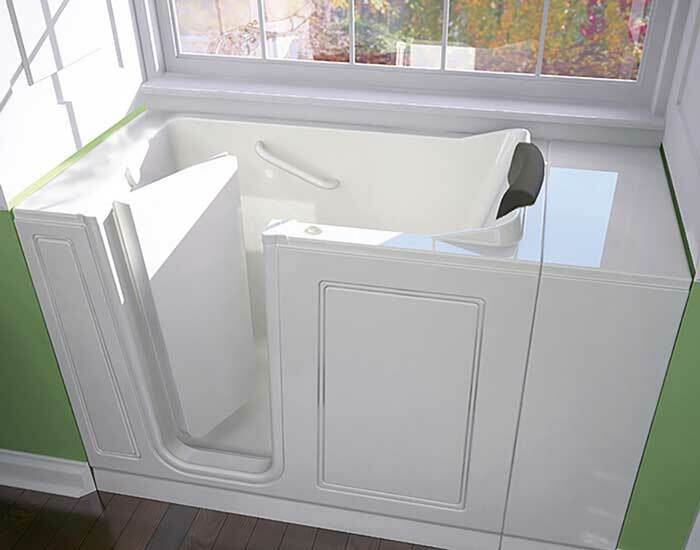 With a walk in tub, there’s no need for stepping over an edge and into the tub – an issue that causes many falls among seniors. Instead, there’s a small door in the side of the tub that opens to give access. The lip is only a few inches to step over compared to a few feet. And usually, there’s a no-slip stool inside so you don’t need to stand. This does mean sitting down in a tub and waiting for it to fill up and then sitting down and waiting while the tub empties, but that’s a small price for a huge increase in safety. If you can’t afford the upgrade of a walk-in tub, installing a glass door instead of a shower curtain can provide a drastic increase in stability. 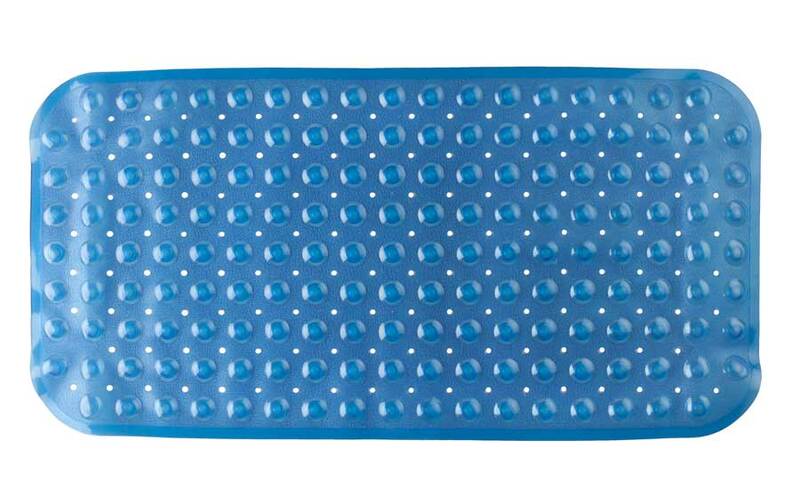 If you or a loved one is more of a shower person, they could benefit from a waterproof shower stool. Sitting down significantly lessens the chance of a fall, and it lets the person take their time to get clean. While you’re in the shower, an adjustable or hand held shower head is an easy addition. Adjustable shower heads are actually on a sliding bar that allows them to be moved to almost any height. They’re great for seniors that may be doing a combination of sitting and standing. A handheld showerhead lets a person move their hands (and the water) around their body instead of having to contort their body to reach the shower stream. Either one of these can be installed in just a few minutes, and they’re often as simple as unscrewing the old one and putting on the new one. Grab bars provide a lot of leverage around the bathroom, from getting in and out of the shower to getting up and down on the toilet. These are usually bolted into the wall and can support up to 300 pounds. You’ll have to either secure it to the studs in the wall or add bracing behind the toilet if the bars attach to the toilet itself. Either way, grab bars provide a significant safety improvement. When most people think of bathroom grab bars, they picture what they’ve seen in hospitals – harsh, metal pieces that can be cold to touch. But don’t let aesthetics deter you. Home bathroom grab bars only cost about $20 each and come in a variety of colors, designs and materials that will match any decor. You’ll even find grab bars that double as toilet paper holders and shower shelves. Almost all bathroom floors are tile, which makes for easy cleaning. But that also makes for a slippery surface, something that can be big trouble for someone struggling with mobility. When you’re getting a bathroom ready for aging in place, be sure to pay attention to the floor. Putting down bath mats is probably the most immediate and cheapest fix. Place them in all areas where water may collect – not just outside the tub, but around the sink as well. Be sure to get a low pile, slip-resistant mat with rubber backing. Fasten them to the floor with rug tape as an added precaution. There’s also the option to actually install rubber flooring, which doesn’t get slippery when wet. Of course, this is a much more expensive option and it doesn’t look very pretty, but it’s also more permanent and safer. No-slip vinyl flooring is an option if rubber flooring is too expensive. Additionally, no-slip paint can also be applied to hard floors. At around $30 per gallon, this is a good “middle of the road” financial option. For most people, a toilet is pretty much a “one size fits all” appliance. We never really think about different options. But for an individual who may struggle to stand or sit, this can be a tough challenge. To make sure simply going to the bathroom isn’t an ordeal, have a higher toilet in place. This can either mean installing a totally new toilet or just purchasing a raised toilet seat that costs about $30 to $50. If you really want to upgrade your toilet, choosing one that has a bidet feature can make a big difference in a person’s hygiene. You probably don’t think much about the sink when you’re thinking bathroom safety, but there are changes you can make. Consider installing levers instead of knobs, which can be tricky for arthritic hands to operate, or installing a pedal/foot operated faucet, so no hands are needed at all. Likewise, you can install a sink with touchless features. These sinks allow you to wave your hand in front of the faucet to turn the water off and on. The sink height is also important, and if the individual is using a wheelchair, you might want to install a lower one that’s easier to reach. It’s also a good idea to check your water heater at this point (there’s no need for it to be able to reach a scalding temperature) or to install an anti-scald device on the sink and shower. While you’re working on the sink, think about improving the countertop. Adding a contrasting color to the edge will improve visibility when it comes to placing things down on the counter. Choosing a countertop with round edges instead of sharp ones can go a long way towards reducing fall injuries. One area of preparing a bathroom for aging in place that’s often overlooked is lighting. Most bathrooms are already well lit, but standard lighting isn’t enough sometimes. Overhead lights can be a challenge to change when they burn out, and you don’t want someone in a situation where they have poor lighting in their bathroom because it was too much of a hassle to change. Add lighting that’s lower on the walls – under shelves or on the toilet itself even. Many extra lights in this style are battery operated and can be added without any rewiring. You might also want to add sensor light switches that automatically turn the light on when motion is detected. This not only keeps someone from fumbling for a light switch in the dark but ensures that lights are turned off when they’re not in use. More than one-third of medicines in the US are taken by elderly patients, and seniors take an average of nine to 13 prescriptions a year. When making a bathroom aging in place friendly, consider the fact that you or a loved one will likely need larger cabinets than normal. Having plenty of space for medicine helps keep them organized. It’s also important to consider that bathroom cabinets may need to be lower than normal to accommodate a person in a wheelchair or someone just sitting down. 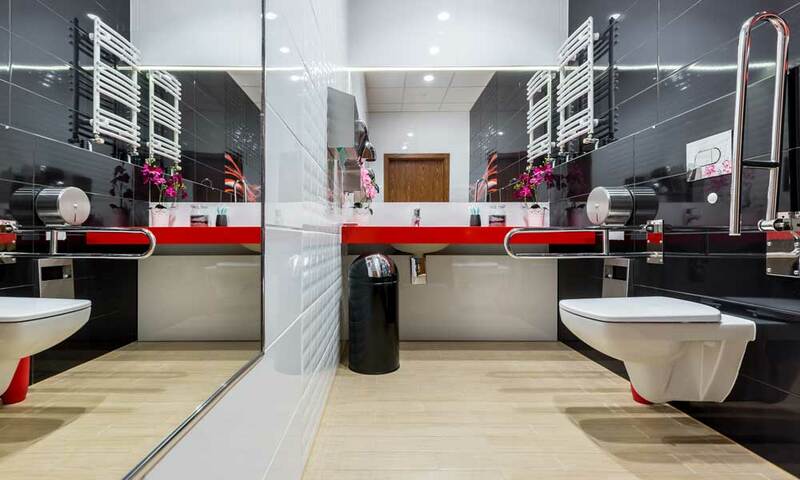 The bathroom can be one of the most dangerous places for an individual as they age, but fortunately, it’s one of the places you can make the most changes (and most cost-effective ones at that). A large part of aging in place is the convenience, but that convenience is no good if the area isn’t safe. If you’re preparing a home for someone aging in place, the bathroom is a great place to begin.